Here we are - another new challenge starts today at 2 Craft Critter Crazies and the sponsor is Rick St. Dennis. They generously supplied images for each of the DT members so all of our inspiration projects are completely different this month. Be sure to check the main challenge blog to see them all. I used a fabulous image called "Dragon" and, if you're into dragons the way my granddaughter is, be sure to check out the Zibbet store. There are several fantastic dragon images over there. 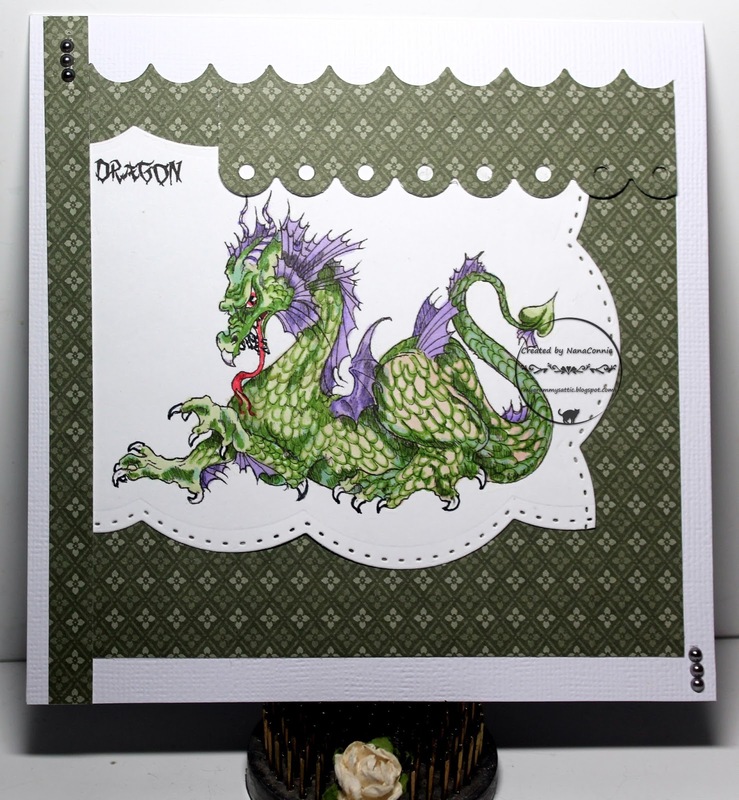 I colored the dragon using ProMarkers, then cut him on three sides with a border die from Spellbinders. The scallops on the dp were also cut with another border die from Spellbinders. The olive green dp came from Stampin' Up and I used 4 different scrap pieces to make all those layers. I thought minimal embellishment would best feature that magnificent dragon so I limited the embellishing to three, tiny pearls in two corners and then left it alone. Cool way of framing that fantastic dragon!!! LOVE IT!! Your coloring on the image is over the top too. FABULOUS!!! This is fabulous, love the papers and the way you have framed this wonderful dragon. That dragon is magnificent and you did a fantastic job showcasing him! Thanks for sharing your creation with us for our Bugs and Critters challenge at Cut it Up! Amazing coloring on your dragon and I love your layout. Thanks for playing along with us at PIP Challenges. VERY clever use of the dies Connie, of course I LOVE the dragon, great colours for him too. Fabulous dragon. Thank you for joining us over at Di's Digi Designs and hope to see you again soon. Fabulous dragon, and a great design. Thanks for entering the challenge at Aud Sentiments and hope to see you again soon. Fabulous Connie, what an awesome Dragon!